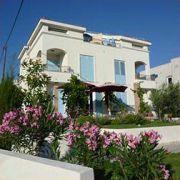 New family house with 3 apartments only 30m from the sea and beach. The apartments are fully equipped, with TV/sat … More » , air conditioning/heating, all have balconies with sea view. The house has private parking, barbecue and outdoor shower. Distance from the shop and bus station less than 80m.